All Around Chuggington Set #Giveaway (2011 Holiday Gift Guide) CLOSED!! My son loves trains! One group of trains that he just adores is the Chuggers from Chuggington!! We love watching Chuggington together, and when watching Chuggington, he loves to have one of his trains handy to play with while watching! Well, my little man has been wanting a Chuggington Train Set for a while now. He has a friend who has one, and every time we go over there, he tells me that he wants the same train set. I think that this Christmas he will be pleasantly surprised. I was sent the Chuggington Interactive Railroad: All Around Chuggington Set. I am pretty sure he will be very pleased with this set. It has a little more to it than his little friends set, and this set is also interactive!! This amazing train set has SmartTalk technology, which means that the trains can interact and recognize the other trains and with some of the key stops on the train set! This set has a elevated spiral for the trains to go down, a four foot layout and three interactive stops! These amazing interactive stops include a loading yard, a tower platform, and a roundhouse! The set includes Wilson, a hopper car, and six pieces of cargo! Then as we add other interactive Chuggington products, they can make out over 250 sounds and words!!! 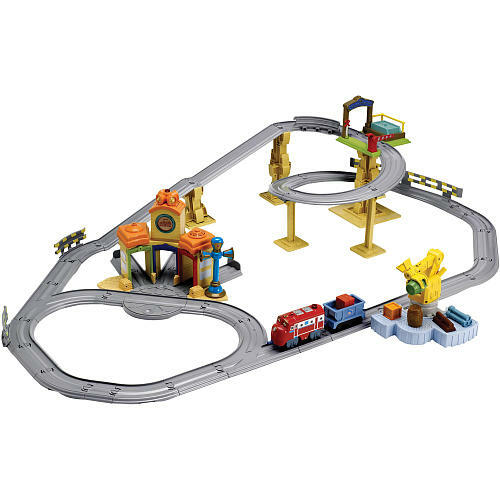 This set makes the perfect gift for any little Chuggington fan out there!! Well the wonderful people from Learning Curve would like to give one of my amazing readers their own Chuggington Interactive Railroad: All Around Chuggington Set, for that little Chuggington fan in their life this holiday season!! Tell me, which of the Chuggington characters is your little Chuggington fans favorite? Please leave me your email with this entry!! This giveaway is open to US residents. This giveaway will end at 11:59 pm on November 24,2011. Winner will be chosen at random.org and will be given 48 hours before another winner will be chosen. All products for reviews and giveaways are given as a sample from the companies. All opinions in reviews I conduct are my own. I was not paid to say anything or review any products. Like Learning Curve on Facebook #2Nancy P.
Like my new Facebook page Nancy P.
1 Like Learning Curve on Facebook Lisa W.
2 Like Learning Curve on Facebook Lisa W.
I entered the West Bend giveaway!